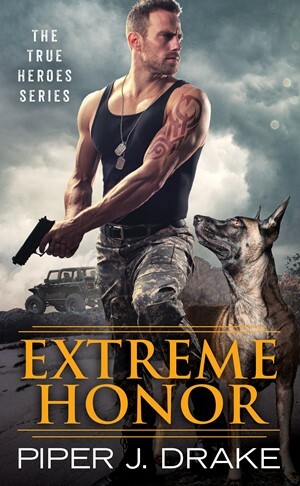 Attractive military men who love and train dogs have got to be a big draw and EXTREME HONOR is lighthearted romantic suspense which combines those two things in a way that is interesting even for people who are not animal lovers. David Cruz is facing his biggest challenge yet: the heartbroken canine partner of his deceased friend, Atlas and he can’t seem to make any headway with him. Until famed dog whisperer Evelyn Jones comes to his aid. Lyn’s charm is not limited to the dog and soon David finds himself drawn in by her. But there is a lot of interest in Atlas from many quarters, because of information he may be in possession of that could reveal a conspiracy, corruption and murders, and destroy many military careers. Both Lyn and David are determined to solve the mystery of what happened to Atlas and his partner and David is also determined to keep Lyn safe from danger. I expected a lot more war front action from this book but I wasn’t disappointed by the lack of it. Lyn and David are good for each other, in spite of their initial reservations. And Atlas is a heart-breaker. The story is well-written and unexpectedly sweet and I enjoyed the mystery. I think Ms. Drake did a great job with Lyn’s character, especially her relationship with her stepfather and its parallels with and impact on her relationship with David. David was a protector to the core, in the way he looked out for Lyn and Atlas and his unrelenting quest to find out what happened to his friend. This is my first read by Ms. Drake and I’m interested in the rest of the books in the series.